6- What's new? Mother's Day Internet Scavenger Hunt! Welcome to the April edition of the Junior Golf NewsLetter, your Youth Golf Magazine. We work so hard all year that we forget to stop and to take some relaxing vacations. So, this is exactly what I did! I took a 2 weeks vacation with my husband and my 2 kids. My main focus was to make the most of my vacation: I relaxed, enjoyed each moment, and had fun with my kids! So, my most important advice to you today...enjoy each moment you spend with your kids during your next vacations. Children grow so fast! Don't miss spending quality time with them, everyday. Just Relax and enjoy reading this junior golf E-zine! When you have kids you usually start looking for summer camps in spring, why? Generally camps start summer registration during the spring season. You should know that there are three main categories of summer camps: residential camps, travel programs and day camps. Residential Camps are mostly for children between 8 and 16 years old, Day Camps for 3-5 years old and up, while Travel Camps often are limited to youngster from 14 to 18 years old. When a camp is ACAA accredited this mean that the camp had its operation reviewed on over 300 standards from staff qualifications to emergency management. As part of the process, the ACA performs a once every three years site visit to the camp. For kids' safety, the American Camp Association Accreditation standards require a staff screening system, which may include, where permitted by law, a criminal background checks. Remember, the fact that a camp is lacking the ACA accreditation does not indicate a poor camp, usually it's because they never bother to apply and get through the process of accreditation. This is particularly true for specialty camps and day camps. For example, if you are looking for academic camps, the ACA only shows about 20 camps with accreditation throughout the country. In Residential kids golf summer camps, usually counsellors who live in the camp and in separate cabins are in charge of supervising the junior campers. Generally, teenager campers have the necessary supervisions while they are also allowed to have a space of their own like a shared large community room for meetings, relaxation and fun. If needed, a Medical attention should always be available by qualified health staff and registered nurses twenty-four hours a day. You should also ask if the camp has a physician available on call and if there is a hospital near the camps if a child needs further medical attention. Some Camps offer a Camper Illness and Accident Policy for each camper. This policy may cover doctor, dentist, or pharmacy bills, you should ask about the policy coverage details before registration. Some camps may provide this coverage at no additional fee...so, don't forget to ask! Some camps required a physical exam signed by a physician to let your kids attend camp, however some other camps are no longer requiring this certificate from kids. The best way to know?...call and ask the camp! If you child have special requirements that require special attention like some dietary needs (kosher, vegetarian, etc. ), medical needs (allergies, asthma, etc. ), or behavioral needs (extreme shyness, ADHD etc.) that will not exclude him or her from a regular camp activities, you should talk about it and ask the kids golf summer camps if they are able at accommodating these specific needs or not. Which kids golf summer camps is the Best? The one that feet your kids and family needs! Keep in mind that you should always involved your kids from the beginning of the process. So, how to choose which type of kids golf summer camps is best for your family? The first step is to ask your son or daughter if they feel ready to sleep in a camp and what type of activities they are looking for beside golf like tennis, arts, riding etc. Remember, kids always want a have Fun! So, help them gets the best fun possible by choosing the right kids golf summer camps with them. Would you like to play more golf and save on green fees? Well, Get your Golf Card! with mine I was able to save up to 50% on green fees in many golf courses in Canada and the US. Don’t miss such great savings, by getting your Golf Card today you will receive a free 1-year subscription to Golf Magazine! And by the way, couples Save on Nationwide golf with Golf Card. So, start savings today. Don’t miss the next issue of the Junior Golf NewsLetter. We'll talk about how you can help your kid be more Confident when playing his favorite sport like Golf. The Junior Golf Guide Website is part of an Internet Scavenger Hunt for Mother's Day! 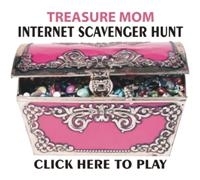 Did you complete the Mother's Day Internet Scavenger Hunt?...if not, Do it Now! it's FREE! A friend of mine, Wendy, suggested an Internet Scavenger Hunt for Mother's Day, and she invited 10 websites to participate...so, I jumped on this Fun opportunity! If anyone deserves to win a prize, you certainly do! Visit 10 Sites where you'll find an answer to one of the 10 Questions...Then, Enter to WIN! The first draw prize will be one (1) Pearl Necklace from Precious China Pearls Pearl and Crystal Jewelry DIY. The second draw prize will be one (1) $50 Amazon Gift Certificate from Todays Women and Health. The third draw prize will be one (1) Change Your Life Challenge 70 Day Life Makeover Program for Women (downloadable ebook and workbook) from Diva Girl Parties and Stuff. The fourth draw prize will be one (1) $20 Gift Certificate from Junior Golf Guide. Every Participant Will Receive the Following Free Ebooks: "spring cleaning and organizing ebook", "baby shower planning guide" and "kid friendly food and dips ebook"
A random draw from all entries will be held at midnight on May 27, 2007 to determine the winners. Don't forget to share this great News with your mother, sisters, and all your family and friends so they can participate in the Internet Scavenger Hunt for Mother's Day! By the Way, don't forget to Tell them to Subscribe to the Junior Golf NewsLetter! *don't forget to read the official Contest Rules. No part of this publication may be reproduced without express written permission from the publisher.